Our venison is a Royal red deer that's farm-raised on mountain ranches in New Zealand, the world leader in producing venison meat. Deer roam freely, feeding on the rich grasses of the mountain meadows and are never fed artificial growth stimulants or antibiotics. Strict guidelines are followed for a superior product. 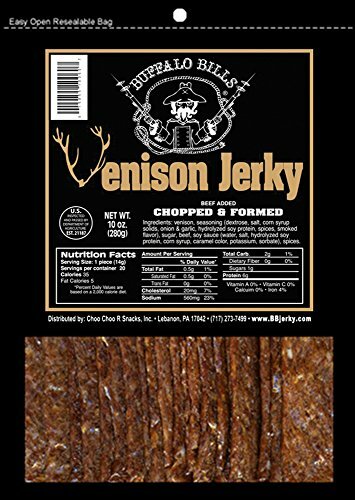 Buffalo Bob's Jerky is made from prime cuts of meat that have been ground, blended with seasonings and formed into flat strips (no casing). Then, the meat is slow-smoked for as long as seven hours to capture the flavors of the selected hardwoods. To ensure freshness all products are individually vacuum-sealed. All Buffalo Bob Wild Game Jerky snacks are smoked for over 12 hours to create a succulent flavor. 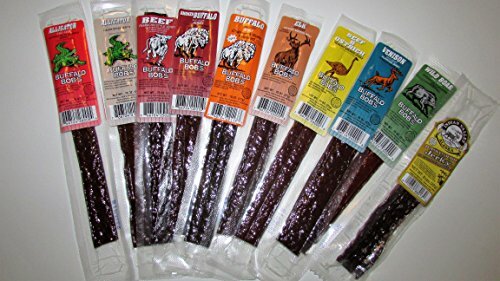 This Assortment includes 10 pieces (one jerky will be Rain Deer and or Elk and or Salmon made for us by Indian Valley Alaska ) BBQ Alligator, Cajun Alligator, Pemmican Style Beef, BBQ Wild Boar, Smoked Buffalo, Chipotle & Garlic Buffalo, Hickory Smoked Elk, Hickory Smoked Ostrich and Peppered Venison Jerky. 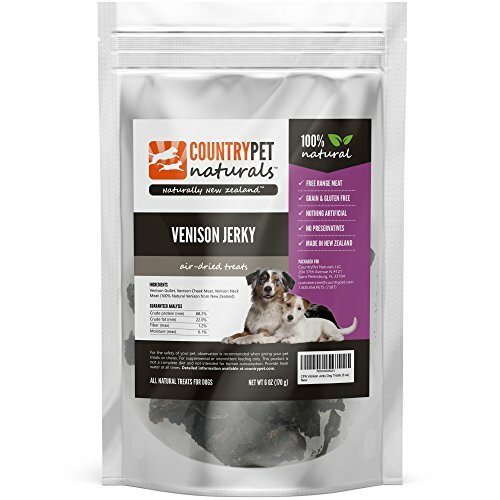 Each piece is made with exotic farm raised animal meat mixed with just enough beef to meet USDA standards. The elk meat used in our products comes from New Zealand. Just like the deer for our venison products, the elk are raised in the same free feeding mountain meadows which means no growth stimulants or antibiotics. 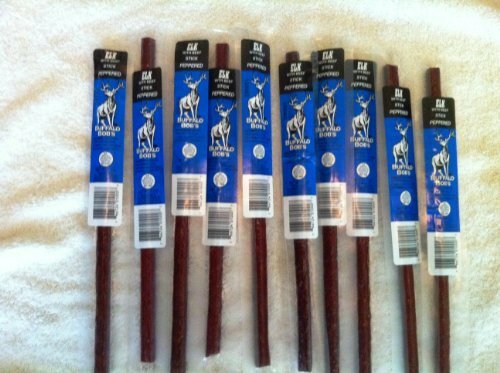 Elk meat is milder, so we enhance the flavor by adding a bit of black pepper to all of our elk products. 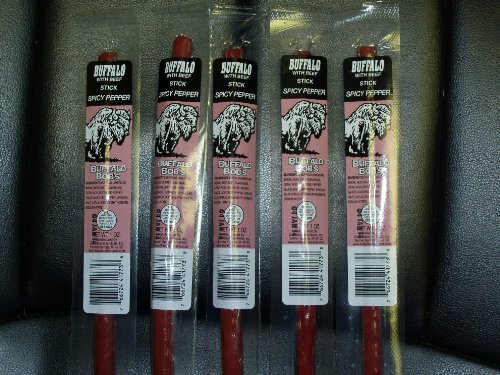 Buffalo Bob's Snack Sticks are a ready to eat, pepperoni-sausage product each weighing one ounce. Ground meat is mixed with seasonings, encased in an edible casing and then slow-smoked over selected hardwoods. To ensure freshness all products are individually vacuum-sealed. 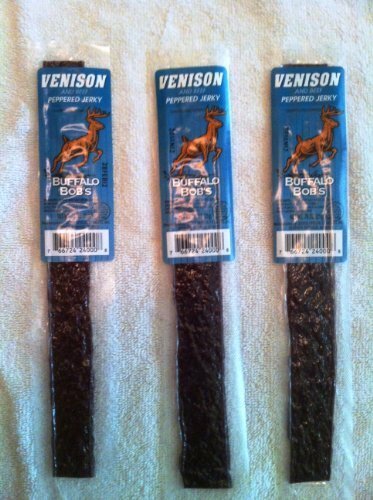 Copyright © Wholesalion.com 2019 - The Best Prices On Farm Raised Venison Jerky Online.